Helmi Järviluoma is a sound, music, and cultural scholar and Professor of Cultural Studies, University of Eastern Finland. Her main research interest has been soundscape studies, especially sonic remembering. Decades of research on this topic have culminated in the publication of Acoustic Environments in Change (2009) which sums up her four consecutive interdisciplinary, international soundscape research projects studying the changing European soundscapes. Currently, her research focuses on the theme of dis-placement, mobilities, aging, memory and technology. Among her 170 publications, Gender and Qualitative Methods (2003/2010) continues to draw positive attention. 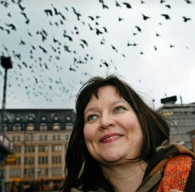 Throughout her career she has been a promoter of scholarly communities, includingThe International Association for the Study of Popular Music (IASPM), latest as General Secretary (2009-2011), and the Nordic Researching Music Censorship Network (2008-2015). After having different leadership roles in the Finnish Society for Ethnomusicology for 17 years, she has been among founders of several new associations, including Finnish Society for Cultural Studies (Vice Chair and Chair 2008-2011). She is a member of the committees of three international journals, including Ambiances, and Popular Music. She has written and directed altogether five radio features for Finnish Broadcasting Company, two alone, two in co-operation with Steven Feld, and one with Noora Vikman.